Shelf Inflicted: Spencer Quinn's Chet and Bernie mysteries, doggone good fun! Spencer Quinn's Chet and Bernie mysteries, doggone good fun! The Publisher Says: Spencer Quinn’s first original e-short story reveals how everyone’s favorite detective duo—Chet the Dog and P.I. Bernie Little—came to meet before their first big case in Dog On It.As fans know, Chet first met Bernie on that fateful day when he flunked out of K-9 police school. The details of that day though have always remained a little vague (like so much in Chet’s doggy brain). All we know is that Chet had been the best leaper in his K-9 class, but for some reason he failed his final leaping test...and that a cat was involved...and that there was some blood. But whose? The test, the cat, the blood—all pieces of a puzzle that, when solved, will bring down a dangerous gang of thieves—and signal the start of a beautiful friendship. My Review: Here's what you need to know...it's exactly as much fun as you'd expect it to be; it's got the trademark Chet narration that leaves nothing to a human imagination except why we don't get to think this way; and it breaks from the canon of history set up in the first two books about Bernie's marriage and Chet's place in it. Like all !&$^!%(^%!$*$$(^$)&%)^(%*!$ ebooks, I can't quote anything to you because how? But the story's only 39pp or so, and it blows by faster than one actually wants it to, and it costs a whopping ninety-nine cents. It's actually not necessary to read from a series standpoint, but heck, for chump change, buy it, read it, and smile for a half-hour. Sounds like a win to me! The Publisher Says: As sidekicks, Maxwell Smart and Agent 99 have nothing on Chet and Bernie. This charming detective duo make their debut in Dog On It, the first volume in Spencer Quinn's new mystery series. 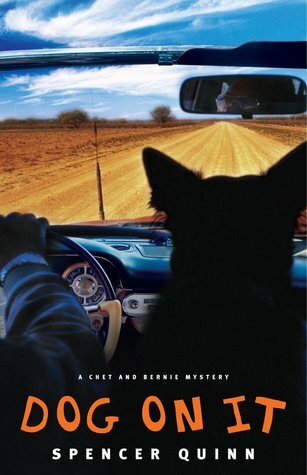 The fast-paced and funny tale is narrated by the inimitable Chet, Bernie's best friend and canine partner, whose personality and preferences are never in doubt: "I liked to sleep at the foot of Bernie's bed, but my favorite napping spot was in the breakfast nook, under the table with my back against the wall, all cool and shady, plus there was often good snacking around Bernie's chair." Bernie's enterprise, the Little Detective Agency, limps along, waiting for the next job to arrive. While Chet freely admits that he doesn't always understand the humans around him, the mutt who failed to graduate from the police academy quickly establishes that he's got a nose made for sniffing out trouble -- as well as the tasty morsel. When the story begins, Chet and Bernie are settled into the companionable routine they established when Bernie got divorced and lost custody of his son. Riding shotgun for stakeouts in Bernie's beat-up convertible (and snarfing up doughnuts and beef jerky) is the perfect life for Chet, though he knows Bernie's worried about cash flow. But their luck is about to change. During a nighttime stroll through the neighborhood -- an older enclave in the southwestern desert that Bernie fears will soon be eclipsed by new development -- the pair encounter a panicked neighbor, Cynthia Chambliss. Waving a wad of bills, she beseeches Bernie to find her daughter, Madison, a 15-year-old who has been missing for several hours. Bernie heeds the call of cash and the urgency of parental concern, but Madison soon returns home on her own, only to disappear again in short order -- this time for several days. Cynthia frantically rehires Bernie, but her ex, Damon Keefer, refuses to cooperate, insisting that Bernie be taken off the investigation. Nevertheless, intrigued by the young girl's apparent connections to a group of Russian thugs, Bernie and Chet follow a trail of clues that leads them into more danger than they'd bargained for. As Chet and Bernie race across the desert toward Las Vegas in their sandblasted Porsche, Quinn's narrative unfolds with mounting suspense. At every stage of their journey, readers will warm to Chet's loyalty and courage -- to say nothing of his delightfully doggy digressions -- and be captivated by Spencer Quinn's deft blend of humor and thrills in this enormously entertaining tale, bound to be the first of many adventures. My Review: Chet and Bernie. Say it with me, now. Chet and Bernie. Get used to saying it, because once you read this book, you'll be saying it a lot to others who haven't read it yet. Chet's a dog. Bernie's a schlub. They're a team, crime solving magic of a team. In a mystery world dominated by cat cozies, they're very unusual and very much a pair of guys. This makes them a breath of fresh air at the least, and a cold Alberta Clipper to blow the cobwebs full of cat-dander out of the bookstores. Come back to the fold, gentlemen, there's a voice a lot like the one in your head all ready to talk to you, and it's a dog's! It's wonderful to read something that's got a new slant on an established trope (read: hoary old cliche), and slants it well enough to keep a cynical old sourpuss like me leaning forward in his seat, eager to see what Chet's going to do next, what Bernie's brain's going to wrest from its depths to help the innocent and land on the wicked with all six feet (four Chet's). LT member cameling gets all the credit for shoving this book into my awareness. Bless you, dear madam. Oh yeah...the schlub gets the girl, too. The right girl. Never mind that she's a vegetarian...who among us is without major character flaws?...she loves Chet. The Publisher Says: The second book of an irresistible series narrated by a loveable and wise dog. In the newest Chet and Bernie mystery, Chet gets a glimpse of the show dog world turned deadly. "We run a detective agency, me and Bernie, called the Little Detective Agency on account of Little being Bernie's last name. My name's Chet, pure and simple. Headquarters is our house on Mesquite Road, a nice place with a big tree out front, perfect for napping under, and the whole canyon easily accessible out back, if it just so happens someone left the gate open. And then, up in the canyon -- well, say no more." My Review: Cute! Very cute! Chet is such a clever boy I want to give him Milk Bones until he faints! And that's kinda the problem under the fun: Cute. It's fun, yes, and it's pleasantly written with a well-imagined dog's point of view. But I think this is a series that needs to be taken in annual doses, and in the proper mood. I am, admittedly, as curmudgeonly as the day is long. But I'm not immune to charm. The series has charm. It's just, well, it's wearing a bit thin at the elbows. Also, I hate Suzie. But I would, wouldn't I, being a dour old gay guy? All at once, I was kind of tired, too. I lay down under the hall table. A roof over your head is always nice. I realized that the house had a roof, of course, so in fact I had two roofs over my head, even better. And what about the ceiling? Under the roof, right, but still a kind of roof, too? I got a bit confused. That's Chet, a bright dog, narrating. The snap-snap-snap of a dog processing into dog-think the idea of roof-house-safe and making it better by getting under a table rings completely true to me. And the magic for me is in Quinn's rendering that into non-cloying humanspeak. And then there's the ending. Whee dawggie. White knuckles and bright flashlights exciting, and even though I was pretty darned sure I knew whodunit, but please forgive me if I don't tell you the bit I was most tensed up about and the bit that Chet, for all his smarts, didn't see as scary and troubling as I did. Read 'em one at a time, in order, and these books will give you thrills and grins and not a few gnawed knuckles. Like the one skinless, bloody nubbin I've got workin' over the unresolved plot line that I can't tell you about. GAH!